Here are some good reasons why Math games score highly over using worksheets. 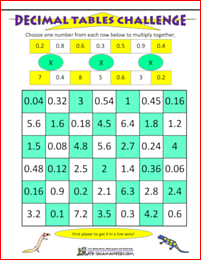 Using games is a great way to learn Math facts and develop mental calculation skills in an easy way. Games are usually fun and very motivating to play. In most games there are a whole lot of other skills involved in playing the game that kids will also pick up, such as strategic thinking. Playing games is usually much better at getting kids to engage in math talk and discuss their learning than using worksheets. 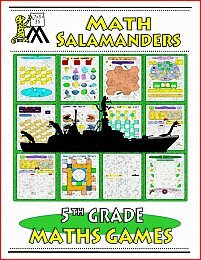 Our Math Games Fifth Grade e-booklet is a booklet containing 28 games designed for 5th graders. There is a wide selection of games to develop a range of math concepts from decimal place value to addition, subtraction and multiplication, to geometry, fractions, money and strategic thinking. For most games, only dice and counters are needed. The ebooklet comes in the form of a pdf download delivered straight to your computer. use this link to go back to our shop. There is a sneak preview of a few of the pages from our e-booklet below. Simply click on the thumbnail image to open up a larger picture of the game. The full booklet contains all the games on this page plus many more which are not available anywhere else.